The Zebra P4T 4" Portable Thermal Transfer Label Printer. Each printer includes: Battery Quick Start Guide 16MB SRAM 8MB Flash. Zebra brings you the world’s first mobile thermal transfer printer with optional RFID upgradability. With the P4T you can print long-life bar code labels and documents up to 4 wide that withstand harsh and outdoor enivronments. With the latest Bluetooth 2.0 or 802.11b/g wireless connectivity battery monitoring large LCD center-loading media and large memory the P4T boasts an array of features that easily handle your printing needs while being intuitive and user-friendly. Don’t let the sleek appearance fool you: the advanced ergonomic design stands up to the most demanding work environments. The P4T serves many industries including government manufacturing transportation logistics mobile workforce and field service. 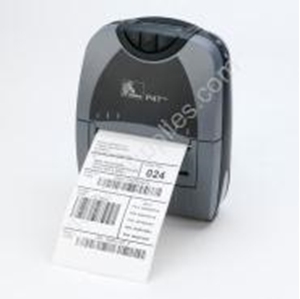 -Prints bar code labels and documents up to 4 wide with a peel mode. -Thermal transfer and direct thermal printing modes. -Large LCD that is daylight readable and low level illumination for low-light conditions. -Open access design for easy media and ribbon loading. -Supports vertical or horizontal printing. -Tolerance of multiple drops up to 5’ to concrete.